SAVE time and $$$ with this Classroom Decor Super Pack! 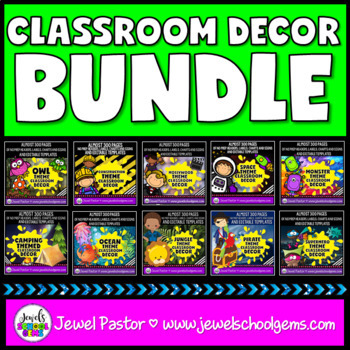 This is a bundle of my 10 classroom decor mega packs! The good news is you GET 10 CLASSROOM THEMES FOR THE PRICE OF 5! That's a savings of almost $50 for almost 2,000 pages! 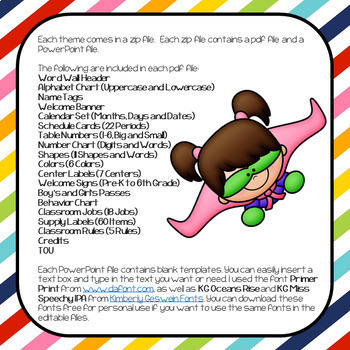 You will get a pdf file with instructions on how to download your Classroom Decor Super Pack. The 10 themes are placed into a zip file and uploaded into my personal Dropbox account given its large file size. Each theme comes in a zip file. Each zip file contains a pdf file and a PowerPoint file. Each PowerPoint file contains blank templates. You can easily insert a text box and type in the text you want or need. I used the font Primer Print from www.dafont.com, as well as KG Oceans Rise and KG Miss Speechy IPA from Kimberly Geswein Fonts. You can download these fonts free for personal use if you want to use the same fonts in the editable files. Please see PREVIEW to get a better idea of what is included in each set. You might also be interested in my other Back to School Resources.